KL’s latest art gallery, Xin Art Space, is opening its doors to an exhibition by poet, writer and activist Datuk A Samad Said. Entitled Black And Red: A Solo Exhibition by A Samad Said, it will showcase more than 40 pieces of black and red ink drawings and paintings on paper in various dimensions that are specially selected from a private collection. 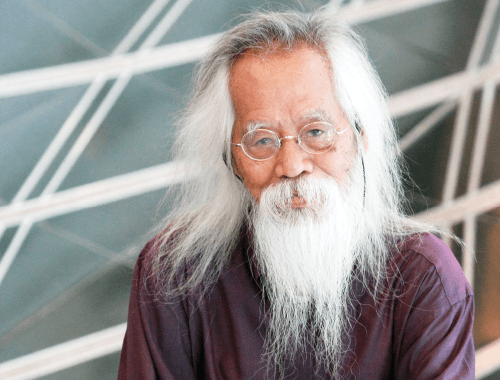 Samad is a distinguished cultural figure and much celebrated Malaysian literary icon. In the last 10 years he has also become a formidable modern artist with two solo exhibitions at Galeri Petronas and the National Art Gallery. His works, expressed in the abstract and expressionist style, reflect his thoughts and observations on life, paticularly the socio-political events of recent years. It was Samad’s son Helmy who first noticed his father’s habit of doodling and scribbling on scraps of paper. Helmy, who handles his father’s publishing rights, would accompany him on tours around the country and observe his father scribble, sketch and doodle during breaks — scraps of art that he would either discard or give away. Recognising their potential value, he provided his father with sketch pads so his thoughts could be documented properly, and the doodles gradually developed into more complex and much larger drawings. The idea for an exhibition came up when Samad wrote the foreword for a collection of poems published by Chan Yong Sin, the co-founder of Xin Art Space. He and his wife Lilian Goh soon discovered a bank of artworks in Helmy’s possession that were very different from Samad’s previously exhibited pieces. The artworks on display, of various dimensions and limited to those produced in black and red inks, symbolise his revolutionary and unique take on the causes he supports. The exhibition presents new perspectives and fresh insights into Samad’s works. Through this exhibition, the two co-founders of Xin Art Space hopes that art lovers and students will be inspired by the unique art of a personality, who with his strokes, daubs and lyrical gestures, reaffirms what art should be in our age of cynicism; fun, spontaneous, honest, unpretentious, cathartic, therapeutic, courageous, truthful, passionate and most importantly, the freedom to be oneself. Catch Black And Red: A Solo Exhibition by A Samad Said until April 5 at Xin Art Space, Level 1, Lot 2-1, Pusat Perniagaan Jelatek, Jalan Jelatek 1, Kuala Lumpur. Gallery hours are from 10am to 6pm on weekdays only. Call (016) 505 1311 for details. This article first appeared in The Edge Financial Daily, on March 30, 2015.